Hazardous work environment vary in nature from greasy or wet floors to random gravel stained paths. In such a case, the stress of protection falls on the head of the workforce trudging round the clock to meet deadlines, project expectations and sustain company aim. That is where safety shoes come in play. Protective boots and Safety Shoes are a must in a hazardous workplace environment as they decrease the risk of workplace injury. The following reason will enlist their importance. Slips, trips and falls are a very common occurring. 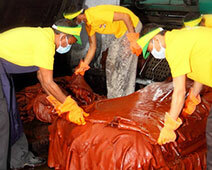 All too often the workforce deployed have to work on wet or oily floor, thus making them very prone to tripping. Protective footwear comes equipped with slip-resistant soles and provide stable footing to move about these floors. This lowers the risk of serious injuries that can cause slips and falls. During the course of working, workers usually step on sharp objects that can prick their feet. At times, they get struck by objects falling from above. In such situations, shoes with heavy-duty soles and thick materials provide a protective encasing to their feet and keeps them safe from the mayhem of mishaps. Crushed feet, broken and lost toes are a few fatalities that are reported on a regular basis by those associated in fishing construction and logging industries. Safety Shoes usually come equipped with toe caps of different make (steel, aluminum and composite) that act as a shield to the feet and prevents your feet from the consequences of crushing injuries. Electricity poses a big risk in the workplace especially to those working in this sector. Normal shoes cannot provide the desired type of protection that workers from this field seek. To protect the workforce from electrical shocks, safety shoes are made from non-conductive materials like rubber and leather. 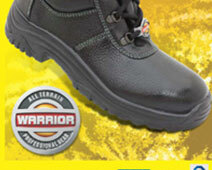 A well thought out investment in a pair of boots for longer periods of protection is always a good idea. Cold weather can lead to injuries such as frost bite and hypothermia that cannot be overlooked in the workplace. People who work outside in extreme weathers are always at risk of getting under the radar of these extremities and need to look after their protection. Most safety boots are designed while keeping this in mind and are insulated to provide protection against cold, rain and snow. Whatever be the case, safety is not the concern of one man alone and should be shared by both the company and the individual. Footwear for workplace offers protection from a lot of hazards but there are still some perils lurking in the background that should never be overlooked. In any case, staying safe and staying alert is what we suggest for a long and safe life.